Share Our Strength’s annual Taste of the Nation NYC(www.tastnewyork.org) event is just days (seven to be exact) away (May 17th at the Grand Hyatt 109 East 42nd Street, NYC). 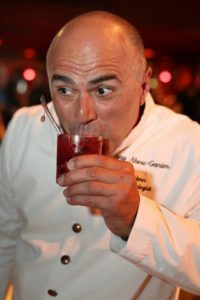 It’s not too late to get your tickets to this evening of fine food, spirits and wines that celebrates the best New York City chefs and mixologists have to offer as they gather to put an end to childhood hunger across America. With an opportunity to sample tastes from over 50 of Manhattan’s top restaurants represented (including: Aquavit, Artisanal, Asia de Cuba, Bar Jamon, Blue Hill, Brasserie Les Halles Casa, Mono, Centrico, Dirt Candy, Eleven Madison Park, Felidia, Gramercy Tavern, Hill Country, ilili, Jean-Georges, Landmarc, Matsugen, Oceana, Picholine, Porter House, Pure Food and Wine, Rickshaw Dumpling Bar, Riingo, Rouge Tomate, Scarpetta, South Gate, Telepan, The Oak Room, The Stanton Social, Tribeca Grill), mix and mingle with the hottest chefs and mixologists, and bid on luxury epicurean and travel experiences this will once again be another memorable evening. Last year thousands were raised to end childhood hunger but sadly the problem persists; join your fellow f&b industry colleagues to put an end to kids going to bed hungry once and for all. 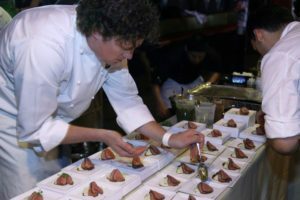 For more information about Share Our Strength and Taste Of the Nation, and to purchase tickets go to: www.newyorktaste.org. 100% of ticket sales support Share Our Strength’s efforts to end childhood hunger. *****INSIDE F&B readers get a tasty discount. Use code: NYCMAY for 20% off your ticket purchase.